All transactions are safe and secure with a reliable history in online purchasing behind each of our associates. 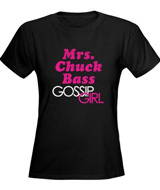 Buy the Mrs. Chuck Bass t-shirt to own Gossip Girl clothing and merchandise. One good scandal deserves another. This is true whether you attend Constance Billard School for Girls or St. Jude's School for Boys, the fictitious all-boys school from the Gossip Girl TV show where you'll find characters like Nate Archibald (Chace Crawford), Chuck Bass (Ed Westwick), and Dan Humphrey (Penn Badgley). These Gossip Girl t-shirts let everyone know which guy is your favorite. This article of clothing is available in a variety of apparel sizes. In addition to the Mrs. Chuck Bass tee above, browse the Gossip Girl Clothing Gallery for more apparel like men's and women's clothes, kids shirts or hoodies.